MATV systems for use at sea. The company's antennas are in use by all NATO navies and are the re- placement standard with the U.S.
Navy and U.S. Coast Guard. Phone uses the ship's hull structure as the communications medium and does not rely upon any installed wir- ing. The heart of the system is a pair of small ultrasonic transducers clamped anywhere on the ship's metal framework. They impart in- audible, high frequency vibrations into the hull for reception at distant points throughout the ship. The system is completely portable con- sisting of a headphone, an ultra- sonic transmitter/receiver, and a small rugged electronics package with a belt clip for hands-free mobil- ity. The rechargeable NiCad batter- ies provide over 8 hours of communi- cations (at a 10 percent transmit duty cycle) as required by Navy speci- fications. Voice communication clar- ity rivals that of a standard com- mercial telephone, according to the company. Western navies, commercial ship- builders, and for use in high-rise buildings. On the open seas, intra-coastal waters or a lake, the ability to com- municate with land-based stations and other vessels is a necessity. Panasonic offers three high-perfor- mance VHF radiotelephones that are reliable enough to go on any voyage. KX-G1500 are all rugged units de- signed to meet high water resis- tance standards, the highest in the marine electronics industry (JIS 6). The three VHF radiotelephones receive all U.S., Canadian and in- ternational channels, as well as 10 weather channels. The units' built- in memory enables the user to pro- gram any number of frequently used channels for easy access and usabil- ity. Watch, an unusual feature that en- ables the user to monitor Channel 16 and another memory channel while listening to a third channel. C. Plath, a division of Litton In- dustries, Inc., one of the world's lead- ing suppliers in ship's navigation equipment, recently introduced new generation gyrocompasses, digital autopilots and electromagnetic speed logs. C. Plath's Navipilot V autopilot can be connected to a gyrocompass and magnetic compass, with con- tinuous output of magnetic compass heading. In case of gyro failure, all electronic users like radar, satnav, satcom, etc., will be fed by magnetic compass with corrected heading. Although Navigat XII gyrocom- pass is suitable for all ship types, it is particularly well suited for high speed yachts and waterjet propelled craft due to its very high follow-up speed of 25 degrees per second. The combination of Navigat XII gyrocompass and Navipilot V auto- pilot makes an excellent compact console system. Swedish-born inventor John Ericsson pioneered the practical application of the propeller. 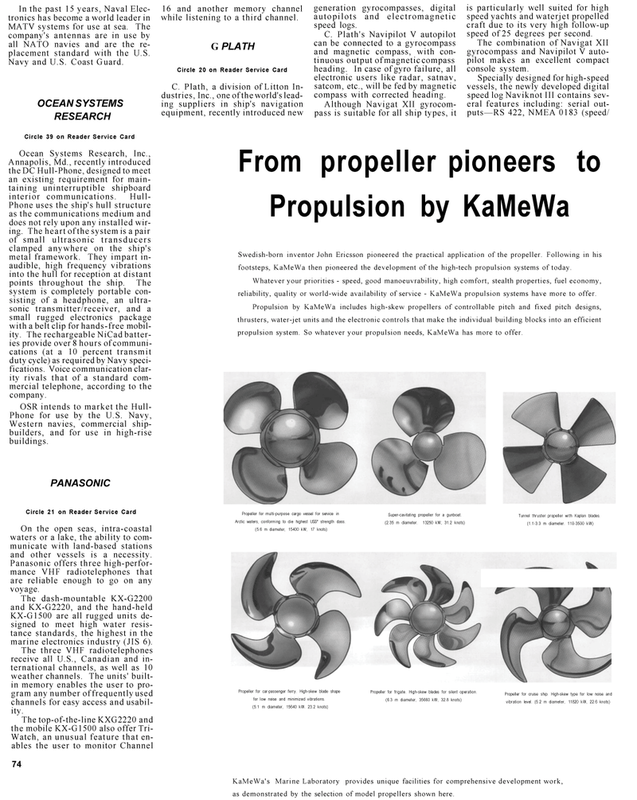 Following in his footsteps, KaMeWa then pioneered the development of the high-tech propulsion systems of today. Whatever your priorities - speed, good manoeuvrability, high comfort, stealth properties, fuel economy, reliability, quality or world-wide availability of service - KaMeWa propulsion systems have more to offer. Propulsion by KaMeWa includes high-skew propellers of controllable pitch and fixed pitch designs, thrusters, water-jet units and the electronic controls that make the individual building blocks into an efficient propulsion system. So whatever your propulsion needs, KaMeWa has more to offer. KaMeWa's Marine Laboratory provides unique facilities for comprehensive development work, as demonstrated by the selection of model propellers shown here.